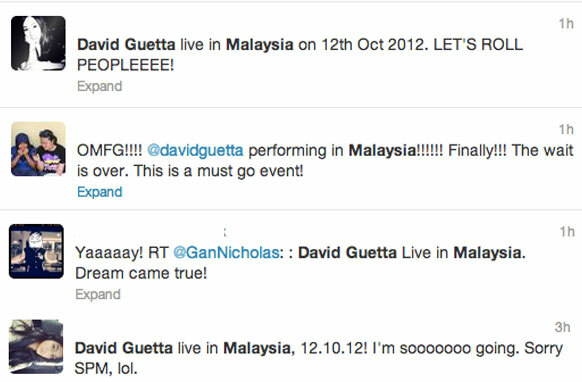 GET exclusive tickets to David Guetta Live In Malaysia on Oct 12 at the Sepang International Circuit. Through special promo events organised by DiGi Telecommunications, fans can take part in various promotional activities leading up to the concert day. Organised by Future Sound Asia, the concert is the first time the renowned house music DJ and producer will perform here. It is part of the French DJ’s Asia Tour to promote his latest album, Nothing But The Beat. Malaysia is the fourth stop.He will be joined by Swedish DJ Alesso, top local electronic dance music (EDM) DJs, Blink & Goldfish, and DJ Xu. From now to Sept 30, text DG at 2016 to purchase the DJ CallerTunes package of 10 songs Without You featuring Usher, Titanium featuring Sia, among others) at RM1 per week and subscribe to DiGiMusic Pluz at RM5 per month. The first 500 customers to download 30 MP3s will get a free ticket. You can also sign-up for prepaid cash card, DiGi Simple MasterCard at selected DiGi Stores in the Klang Valley or at DiGi road shows at selected local universities for immediate redemption of one ticket per application. Existing cardholders who recommend three friends to sign-up in a single visit will each receive a free ticket, while stocks last. The promotion ends Oct 5. Also, spend RM100 on reloads or bills at selected DiGi Stores and redeem 1,000 BonusLink points to receive one ticket, while stocks last. You can also participate in the DiGi Deep Green Handset Recycling Campaign at the DiGi 360o Store (SoHoKL outlet) by having two people recycle three handsets to receive two tickets immediately (ends Sept 30).